The Rashtriya Janata Dal on Monday released its manifesto, titled Pratibadhta Patra (commitment document), promising reservation for SCs, STs, EBC and OBCs in the private sector and the higher judiciary, in proportion to their population. The ceiling -- a 50 per cent cap -- had been broken after giving 10 per cent quota to the weaker sections among the general category so the people belonging to these categories (SCs, STs, EBC and OBCs) should be given reservation on the basis of their population, party leader Tejashwi Yadav said while releasing the manifesto in Patna. The apex court had fixed a cap of 50 per cent on total reservation and the Centre last month justified in Supreme Court its recent law granting 10-per cent quota for economically weaker sections, saying it was brought in to promote "social equality". The RJD also demanded from the Centre to make public the socio economic caste census data, carried out by the United Progressive Alliance government. 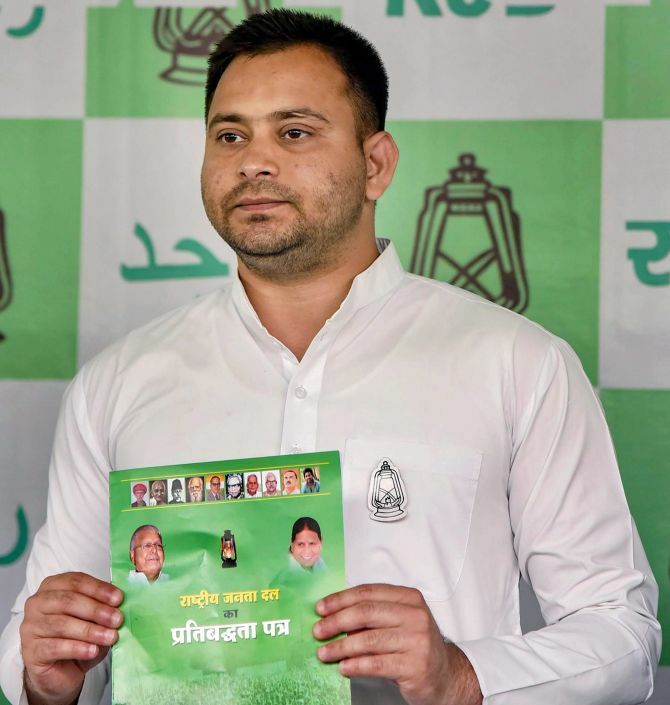 Releasing the manifesto, Tejashwi Prasad Yadav, also the leader of the opposition in the state, said that "it is not the manifesto of RJD, rather it is a 'pratibadhta patra' of the party". According to the seat-sharing formula for the 40 Lok Sabha seats in Bihar announced by the opposition 'Mahagathbandhan', 20 seats will be fought by the RJD and nine by the Congress. Of the 20 constituencies, the RJD has left the Ara seat to the Communist Party of India-Marxist Leninist Liberation. Upendra Kushwaha's Rashtriya Lok Samta Party and Mukesh Sahni's Vikasheel Insan Party will field candidates on five and three seats respectively. Former chief minister Jitan Ram Manjhi's Hindustan Awam Morcha has been given three seats. Will Modi's quota meet same fate as Narasimha Rao's?